If you’re a fan of "match-three" puzzles and/or “hidden object” puzzles, Jewel Quest Mysteries: Curse of the Emerald Tear will provide you with many hours of entertainment. I Spy with My Little Eye: Hidden object puzzle games make up the bulk of Jewel Quest Mysteries. Developed by EA Mobile, the game follows intrepid explorers Rupert and Emma as they trek across Egypt in search of the “Emerald Tear.” The storyline is intriguing to the end, and the graphics are incredibly well done. 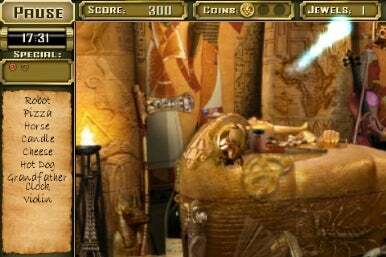 The meat of the game consists of "hidden object" puzzles, while 20 match-three puzzles provide a welcome break in the action (aka the creeping insanity that comes from scouring pictures for hidden objects). The “hidden object” puzzles take place across 18 different scenes—all of which are gorgeous and incredibly detailed. Each scene comes with a list of ten or so “hidden objects” that the user must locate and tap. This is not quite as easy as it sounds, as the scenes are packed with items (everything from cell phones to bottle caps), and some of the objects are trickily blended into the background. Also located in the scenes are coins and jewels, which can be tapped and redeemed for upgrades (such as extra time) and “specials” (some can even locate hard-to-find items for you). The match-three puzzles are like typical Jewel Quest puzzles: you must match three jewels to remove them from the board and turn their backing tiles gold. The puzzle is completed when the entire board of tiles is turned to gold. There are between two and eight “hidden object” puzzles for every match-three puzzle. This game is strangely addictive, despite the fact that the awesome detail of the scenes will start to give you a headache after a few hours. If you do start to feel queasy from all the zooming in and out, you can pause the game at any time and return right back to where you started. Up to four player profiles can be saved, and there’s even a multiplayer mode for competing against friends (via Wi-Fi or Bluetooth). The only real downside was the headache-factor, but I was playing on a red-eye to Charlotte, so it may not have been the game that was giving me a headache. Overall, it’s a fantastic game, beautifully drawn, and one of the best ways I can think of to spend $1.